1. A 65-year-old presents for a yearly examination to check the progress of previously diagnosed cataracts. Medical history is positive for COPD and Adult Onset DM. BCVA is OD 20/30 and OS 20/25. IOPs are OD 23 mmHg and OS 24 mmHg. The optic nerves show inferior notching of both discs with early superior arcuate scotomas OU. Which of the following glaucoma medications is most appropriate? 2. A patient presents with a four-day history of a red, irritated right eye that has just developed lid swelling. The patient states that a friend had “pink eye” last week. What other finding is most likely to confirm the proper diagnosis? 3. A patient being followed for cataracts now complains of significant difficulty driving at night, and glare around lights. Slit lamp examination reveals 2+ NS OU. Topography reveals 1.5 diopters of corneal cylinder in both eyes. Goals are discussed, and it is ascertained that the patient would like to be able to see clearly at distance but does not mind wearing readers up close. Which of the following is the most appropriate IOL recommendation for this patient? 4. A 7th grader presents for her first eye examination with complaints of being unable to clearly see the board in school. Her school performance and grades are good. BCVA is 20/200 OD and OS. Pupil testing and fundus examination are normal. Which of the following tests is most likely to confirm your suspected diagnosis? 6. 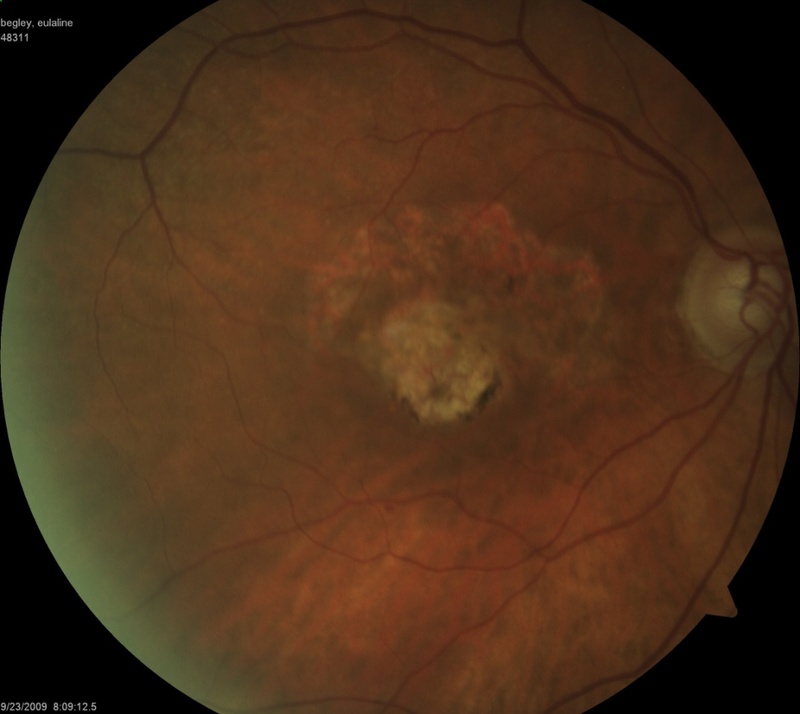 A patient presents with a history of vision loss in the right eye three years ago. The fundus exam is performed. (See exhibit). 7. 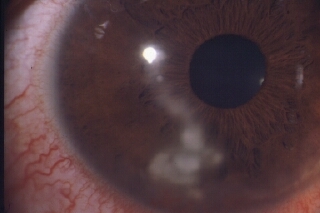 A patient presents with a history of a red eye one year ago that was treated with unspecified drops. The patient advises that vision never came back completely. Slit lamp examination of the right eye was normal. The left eye is shown in the exhibit. Which of the following is most likely abnormal in this patient? 9. The parent of a 3-year-old child notices that the child’s eyes are crossing during near activities. Cover test reveals 3∆ esophoria at distance, 12∆ esotropia at near. Manifest refraction yields OD +3.00 SPH 20/25, OS +4.50 SPH 20/50. Cycloplegic refraction is OD +4.00 SPH, OS +5.50 SPH. Which of the following options is the appropriate treatment for this patient? A. No treatment at this time. Recheck in one year. B. Rx OD +3.00 SPH, OS +4.50 SPH. Patch OD 2 hours per day. C.Rx OD +4.00 SPH, OS +5.50 SPH. Patch OD 2 hours per day. D. Rx OD +4.00 SPH, OS +5.50 SPH. Patch OD full time.